16 year Indo veteran Gemma O'Doherty recently achieved the distinction of being the only Independent journalist to be made redundant compulsorily. According to this week's Phoenix her sacking was linked to her coverage of the penalty points story earlier in the year. As the penalty points scandal rumbled on in April it seems that O'Doherty went to Garda Commissioner Callinan's house to check that he had been issued with penalty points that had been cancelled. Callinan's wife confirmed that the address was correct and the Commissioner lived there. O'Doherty was quickly hauled in by management and given a dressing down, in particular by Stephen Rae, former editor of The Garda Review and recently promoted Editor in Chief of the combined Independent titles. The Commissioner's penalty points story remained in limbo for a week until TV3 got wind of it and the Indo decided to publish the story. However, O'Doherty some weeks later was offered voluntary redundancy and was then sacked after refusing to take the offer. Her single minded pursuit of the cover up behind the Father Niall Molloy murder probably didn't endear her to the Garda Siochana either. GEMMA O'DOHERTY – 19 APRIL 2013THE garda Commissioner has admitted he had penalty points wiped out after incurring them on official force duties. Last edited by PaddyJoe; 06-09-2013 at 01:05 AM. I am more than surprised that no one has commented on this OP and amused but not surprised that the editor in chief of the Indo is a Garda hack given that they employ Paul Williams who is essentially the Garda Press Office at Large ...Gardai should be aware of the jailing of their counterparts in the Uk for taking cash for info. We need more on this story any sources? The only source for the story at the moment as far as I know is the Phoenix. Again according to the story the NUJ has made a statement but I can't find any trace of it. Perhaps because it was 2 o'clock in the morning, but it has been discussed quite a bit on other threads already. Audrey Carville covered the story on Drivetime today just after six in an interview with Gemma Doherty of the Indo who has spent a lot of time on it over the last three years. Doherty said the family are relieved that the DPP and the Gardai's roles in the story are finished and they can now press for an independent inquiry. Carville said that Drivetime had sent a list of questions to the Gardai on the case, including the deal done with the General to return the stolen case files, but did not receive a reply except for a statement saying that their investigations were complete and the files had been sent to the DPP. Notable and not surprising that these updates were made public in the desert days of late August. Audio clip of the Gemma Doherty interview on Drivetime 22nd August. Compulsory Redundancy of one person, under these circumstances, does not sound like a genuine redundancy at all. I hope that Gemma Doherty is taking advice on this. 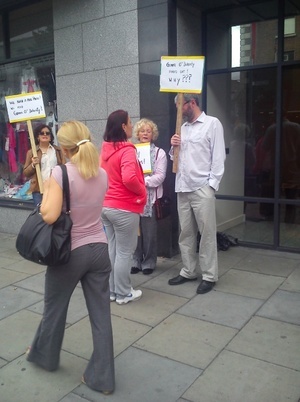 Talking to folk on twitter there, goldhawk says a "statement from the NUJ chapel at Independent House" so maybe the issue never made it up the line to formal union action though broadsheet has photos of protest outside INM offices last month so someone was doing something. It sounded like a crackdown coming from the top as it would remind you of Stalinist years where any dirty linen is displayed and discarded quickly. Their objective is to shut down any dissent if any as which had applied to Gemma O Doherty, which was really disgusting just because of penalty point exposure. That is sickening. It demonstrated also they don't entertain any thoughts of harbouring of any whistle-blowers here which expose Govt's bad light. That's FG/Lab govt is using these kind of mechanism indirectly and direct to dampen the dissent voices as well as it had also demonstrated at the same time, that FG govt is the most authoritarian govt ever to grace on our shores. Last edited by disability student; 06-09-2013 at 11:57 AM. Apparently she was told that she was being sacked because she had "failed to embrace the digital age". You don't cross the Maffia state and keep your job at Maffia central. An utterly corrupt rag that reflects the utterly corrupt Insider-Establishment relationships that the public willingly accept. One of Ireland's leading investigative journalists has been fired after being called "a rogue reporter". The departure from the Irish Independent of Gemma O'Doherty, a multi award-winning senior features writer, has received almost no coverage in the rest of the media. But an article in the satirical magazine, The Phoenix, has revealed incidents that occurred before her sacking. n April this year, she doorstepped Ireland's police chief, Garda commissioner Martin Callinan, and questioned his wife while seeking to confirm a story that penalty points had been wiped from Callinan's driving record.The article states that two executives at O'Doherty's paper were "appalled" at her making the approach without previously informing her bosses. Dear Mr Rae,We write to you in disbelief at your decision to fire Gemma O’Doherty, chief features writer at the Irish Independent and one of the country’s most talented and courageous journalists. Gemma is a reporter of the highest professionalism and integrity, who has done huge service for her country, and her newspaper, through her work in exposing injustice and Garda corruption. We are the parents of children who have been murdered. We represent Irish people who have lost family members in violent circumstances. Some of us have been very badly treated by the Gardai. When the criminal justice system and the Gardai failed us, Gemma listened. Now you seek to silence her. In doing so, you must also want to silence us. Ms O’Doherty’s remarkable journalistic pedigree speaks for itself. In her 16 years with the Irish Independent, she has won numerous awards – from campaigning journalist of the year to medical journalist of the Year, and last year, she was nominated for two national media awards, crime journalist of the year, and feature writer of the year. Her ground-breaking journalism has led to the establishment of two state investigations in recent months, and she is singlehandedly responsible for the reopening of the 30-year-old murder file into Fr Niall Molloy. Her campaigning writing is regularly raised on the floor of Leinster House, and on television and radio. Indeed, your own Sunday Independent recently wrote a lengthy article praising her astonishing work on the horrific murder of Fr Molloy. As Irish citizens, we see her dismissal as nothing less than a grotesque attack on press freedom, human rights and democracy. Your silencing of Gemma – the only person you have handpicked for sacking in INM – is a morally repugnant and indefensible act which has consequences for all of your readers and the broader public. Nancy Shanahan (Justice for Aongus Shanahan, Limerick); Julia Walsh (Justice for Desmond Walsh, Limerick); Genevieve and Walter Smith (Victims of Garda harassment, Cavan); Nuala O’Gabhnain (Justice for Jim Goonan, Offaly); David Walsh(Justice for Mary and Molly Walsh, Waterford) Sean and Anne Doherty (Justice for Mary Boyle, Donegal). It really is a disgrace and the silence of Irish journalists on this is deeply unhealthy. FG/Lab govt is fast becoming a STASI mark 2 police as they go around dampening anything that was/is damaging to their government. Simply a communist government in disguise with EMC included as well.